Sometimes I fear that my concentration on the scientific disciplines has left me with strong abstract analytical skills but little in the way of common sense. I'm to be seen hobbling around the department today having been for a lovely walk in the warm afternoon sun earlier. Having spent the afternoon shivering in an air conditioned office I took off my shoes and reveled in the powerful heat of the tarmac. I greeted the burning pain with a smile of satisfaction as the rest of my body heated up. Back in the office as I put my flip flops back on and started to walk around the welts started swelling and I now can not let my feet touch the ground. Anyway, apart from a mild loss of any dignity I may once have had, today has been superb as I've been attending the Complex Systems Summer School. A lecture this morning on the mathematics of genetic algorithms got my mind racing through ideas from topology and the possible studies one could do of the properties of a manifold mapped out as a system evolves through an evolutionary algorithm (the species are defined in terms of a real vector space). It made me realise the power of such interdisciplinary collaborations. I'm sure that I wasn't thinking anything very new but with enough time spent talking with other researchers in other areas, I'm sure that a lot can be achieved. A second talk about the logarithmic relationship between metabolic rates of animals and their mass which holds over around 15 orders of magnitude of mass was also very interesting. If you measure for instance the heartbeat of animals as a function of their body mass, the data lie on a straight line to incredibly high accuracy over a huge range of animal sizes. What this allows is then the understanding of the differences between animals by finding the subtle deviations from these logarithmic scalings. By dimensional arguments and studying the behaviour of the cardiovascular system in a relatively simplified model, the observations can be explained very well. A third lecture on symbolic dynamics and measure theory was also very interesting, though having missed the first lecture I failed to understand the application. Lots more interesting talks to come. See the Wiki linked from the previous post to read some of the slides from the talks, all very interesting. I'm spending the rest of my time, apart from trying to finish writing a paper, reading through two very impressive papers: Exploring improved holographic theories for QCD, parts I and II, by Gursoy, Kiritsis and Nitti. I'll be giving a talk on these next week and the 110+ pages have a lot of detail to get through. Some great work though and vital reading if you are interested in AdS/QCD. 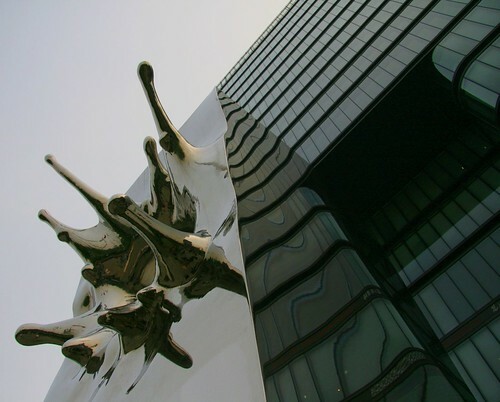 I'll leave you with another view of my favourite puzzling Chinese sculpture outside the Zhongguancun book building.